bok What's the most efficient way to progress with gear? What's the most efficient way to progress with gear? Thread: What's the most efficient way to progress with gear? Right now my team is JD-Musk-Emilia and I've reached the moment where I have to upgrade my gear because I can't progress with the raids I can solo. For Inifinito Challenge I can't get past lv 26. What should I upgrade first? I don't really care if I am to buy items or create them on my own. What wonders me though is what type of gear I should aim for, like 33 ar base weapons or another ones. Note that the amount of vis I have is small, I can make like 25m-30m vis daily, so not too much. What I mean by this is please don't say things like "go for strata gear". Or maybe I should change a character or two to make the start easier? Last edited by qwertyasad; 03-05-2016 at 05:01 PM. Getting Elite Le Noir for armor is the way to go. They get cheaper and cheaper. A +6 3DR ELN on a fighter like JD will let him survive in Armonia without problem if he has over lvl 150 holiness. With +6 3Dr ELN You can finish Armonia EP5 quest. Sometimes you will need extra help from steroids, filler and wings. Didn't need food for once. +7 33AR weapons are good. It has same AR as +5 strata or Armonia weapon. I'm using +5 Strata from event and it finally let me do some hard BH at a reasonable time. +6 33/34 should be good too if money is tight. You must have one of the followings. After that, You must choose a team and stick to it for at least 6 months.I'll just write some chars. 1)Lionel-Most flexible char in game.You can use him with any char.Leather Armor. 2)Kess-Better for ranged team.Leather Armor. 3)Warlock-Allows you to replace Rosa with Anis and magic dps for some raids. 1)E. Judith-She can simply do everything.Tank/Support/Dps.Heavy Armor. 2)SFL-.Mainly spacebar and counting skills.Heavy Armor. 1)Lynn-Pure DPS, good at every raid as long as she stays alive.Heavy Armor. 2)BFC-Skill DPS,high skill damage.Heavy Armor. 3)JD-Good at low def spacebar.Heavy Armor. 4)Asoka-Now deals 2x damage to target in moon crescent status and high damage to heavy with skills.Heavy Armor. 5)Adriana and Cadet Adriana-I have no idea whether she is good or not but skill gives 6% ide and crit damage. 2)Stock Musk-High IDE.Skill spam.Leather Armor. 1)Jane- 100% chance to -30 def.Leather Armor. 2)Brunie- Chance to cast MW -50 def.Leather Armor. 3)Rascel- 100% chance to deal +3k damage on target.24 family, 40 dps = 120k damage per cycle(Assuming all chars have same aspd).Leather Armor. 4)Lisa-Grinding and High Eva.Ignorable dps. I have no idea about it and I never used magic chars on raids. All I can say is you should use magic chars depending on bosses res. 1)Rachel-High Pene and only magic spacebar. 3)Selene-Makes good use of debuffs. 4)Black Judith-I have no idea whether she is good or not.Since she can't cast as fast as E.J and can't tank as good as E.J I simply ignored. You need to calculate it on your own.I have no idea which raids are most efficient for you. 1)+5 Vigilar-Easy to chip and Best weapons in game. 2)+6 Strata-Easy to get now. 3)+6 Armonia-Because of vigilars and expensive crafting you can ignore these. 4)+6/7 34 ar-Good alternative to above items with lower cost. 5)+6/7 33 ar-Better anything below except 6th. 6)+8 E92 Pistol economically best pistol in game. 7)E96/E100 better than crescemento,you can just skip to cons. 1)+7 Dr +3 Greek Croma-39 Dr armor,You can use it until you get Strata or Armonia Set. 2)+6 Dr +3 Elite Le Noir-37 Dr armor,Better than anything below. 1)+10 EWOA,EHOA,ESOA,ECOR until you get strata/armonia set. 2)WOA,HOA,SOA,COR at least you won't have to chip. 3)You can ignore bristia earrings since they are expensive. 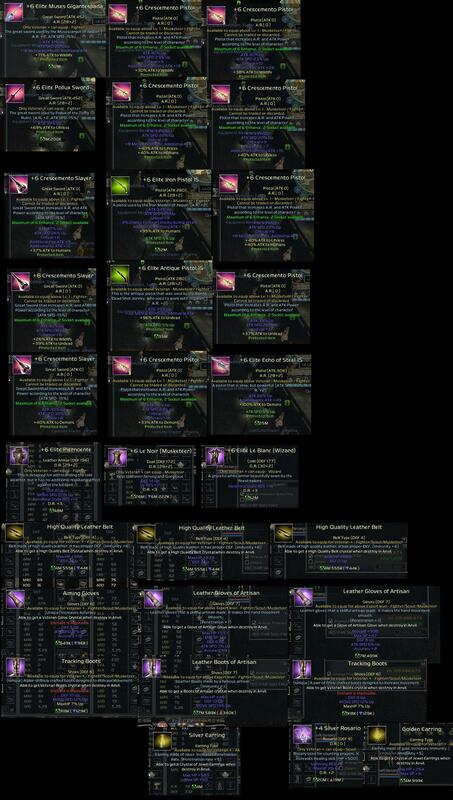 1)+10 Bristia , if you don't want to get strata set or armonia set and if you want to use bristia weapons. Last edited by Emperor; 03-06-2016 at 02:57 PM. Thank you very much kind sir, I really appreciate it! In the meantime I've decided to put Calyce in place of Musk, as she needs only one weapon. Also, I've forgotten about Experimental Weapons/Armors that I could get, so for one month I'll have 35 AR weapons with +100% racial. One question though, how is Laura in terms of Ranged DPS? Is she better than Calyce? 1) Lora - High dps to soft, high resist vs magic, she can ignore any magic, 100% to debuff -30% atk and casting speed... die fast vs melee. Last edited by Xelaine; 03-06-2016 at 05:07 PM. 1) Lora - High dps vs soft, high resist vs magic, she can ignore any magic, 100% to debuff -30% atk and casting speed... die fast vs melee. Leather* since it is pistol. If lora could be dps, then raven is god of dps. Beside her -atk debuff, she didnt show any special in term of dps. Last edited by egado; 03-10-2016 at 07:43 AM.